This is indeed quite tricky to accomplish if you do not know your way around in Doomsday. I assume that you do know how to add add-ons in Doomsday? If not please check here. 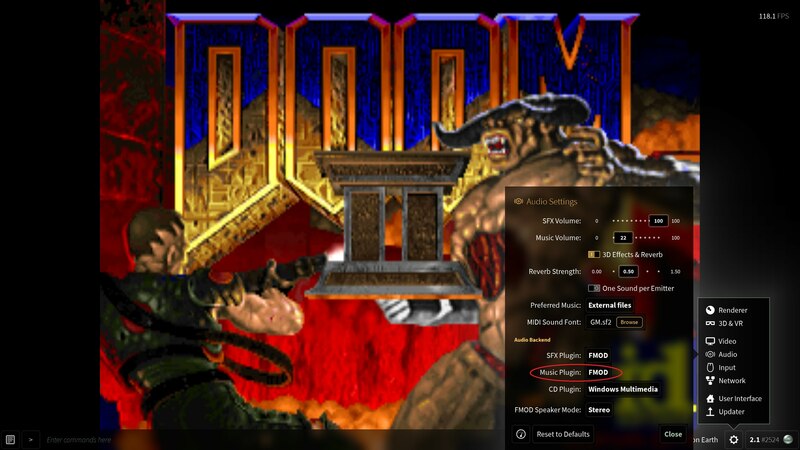 Start DOOM with the Doom Classic Music addon activated. From the in-game menu select "Options", then "Show taskbar". Click on the little white gear at the bottom right of the screen and choose "Audio" from the pop-up menu. Make sure to set "Music Plugin" to FMOD (see screenshot). Now close all menus and restart DOOM (this is vital). i don't think this is it - i am having the same problem but only with doom 2 - doom 1 works just fine - in doom 2 the pk3 gets loaded but only midi files play. i think its a bug somewhere.